At work, we’re sometimes presented with problems that can’t be solved quickly or easily. And sometimes, after working on a certain problem, it becomes evident that there is no solution at all. This can be really disheartening, and it may lead us to believe that our time and effort has been wasted. 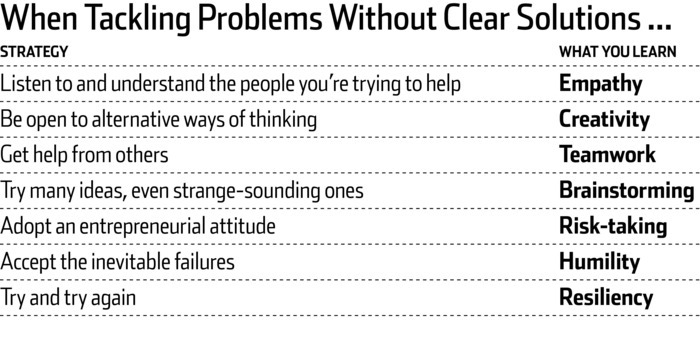 But in reality, a lot can be learned and gained from working on unsolvable problems. At Northwestern University, freshman Engineering students are required to take a Design Thinking and Communication class. In this class, they are put into small groups and asked to solve a challenging problem experienced by disabled people. For instance, they might be asked to create a device that will allow a person who only has the use of one hand to tie his or her shoelaces. Or they might be asked to devise a way for a person with weakened arms to pull on tight support stockings. Sometimes these problems can be solved. But sometimes, there is no solution. So if you spend a lot of energy and effort trying to solve a problem that ultimately has no solution, it can be very frustrating. But remember, it’s not a waste of time! The process itself can be beneficial. It can help you to develop and strengthen some very valuable skills. « Instant Messaging Your Coworkers – How to Do It Right	» Do You Lack Emotional Intelligence?